Microsoft Azure SQL Database is a managed cloud database (SaaS) provided as part of Microsoft Azure. A cloud database is a database that runs on a cloud computing platform, and access to it is provided as a service. Managed database services take care of scalability, backup, and high availability of the database. Microsoft Azure SQL Database includes built-in intelligence that learns app patterns and adapts to maximize performance, reliability, and data protection. The question of whether or not to put your business data in the cloud is getting easier and easier these days and a lot of that is thanks to Microsoft’s investment in Microsoft Azure. Their strategy to create an infrastructure, like Microsoft Azure SQL Database, that can manage big data (as big as petabyte-scale) and everything on down from that is working and it’s working well. 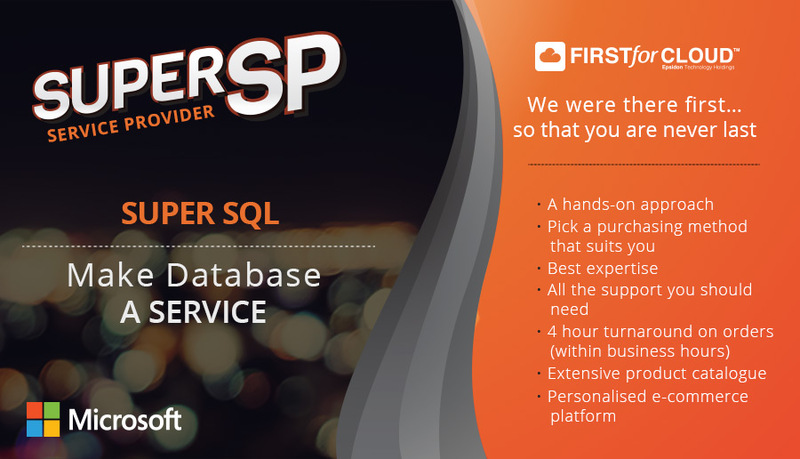 First of all, flexible service plans for SQL Database meet the needs of both big and small business users. SQL is no longer way out of reach for smaller operations because the pricing structure allows users to pay as little as $4.99 per database per month with a maximum storage set at 150 GB per database. That’s a lot of space for very little cost. High availability architectures mean high speed connectivity and data retrieval as well as low down time at your organization. There’s nothing worse than stopping business because your technology can’t keep up, but that is no longer a problem with SQL Database. Secondly, companies can add application instances as needed through sharding, for example. Sharding is a type of database partitioning that separates very large databases into smaller, faster, more easily managed parts called data shards. Not only can you spin nodes up and down on demand, you can leverage a federation infrastructure to scale more easily without affecting other areas of the server. SQL Azure Federation Data Migration Wizard can even further automate this process, which impacts your organization and the employees much less. Lastly, there are multiple levels of implementation that you can benefit from. If you just need a website and a database, you can hitch a SQL Azure instance to an Azure website and you’re done! If you need a full-blown virtual machine(VM) now or even down the road, you can get that as well. You can even use a locally deployed instance of SQL Server in the VM instead of SQL Azure. These implementation options help make your company more adaptable to the inevitable changes it undergoes on a regular basis. With SQL Azure, you’re not stuck. You’re on a foundation that encourages growth while working with it! SQL developers are familiar with all things SQL and SQL Database can be updated with SQLCMD or the SQL Server Management Studio. Better yet, there’s no coding required! Using standard SQL, it’s much easier to manage database systems without having to write or update a huge amount of code. With no administrative duties on your physical location, employees can take time for strategic work to advance and grow all-around business success. When your database is hosted in the cloud, you don’t have to deal with setting up SQL Server, apportioning databases, and dealing with physical machine maintenance and upkeep. All of this results in better alignment of your organization and ultimately more time on your side. Ramp up time with SQL Database is now easier than ever and free! SQL Data Sync allows you to either sync your SQL Server-stored data or migrate the data without having to worry about the costs to migrate by syncing gigabyte-sized tables. Azure SQL Database is offered either as a Standalone database or Elastic database pool, and is priced in three tiers: Basic, Standard and Premium. Each tier offers different performance levels to accommodate a variety of workloads. The resources available for Standalone databases are expressed in terms of Database Transaction Units (DTUs) and for elastic pools in terms of elastic DTUs or eDTUs. A DTU is defined as a blended measure of CPU, memory, and data I/O and transaction log I/O in a ratio determined by an OLTP benchmark workload designed to be typical of real-world OLTP workloads. Databases are available as Standalone databases or in database pools which allow multiple databases to share storage and compute resources. Make building and maintaining applications easier and more productive. With built-in intelligence that learns app patterns and adapts to maximize performance, reliability, and data protection, SQL Database is a cloud database built for developers. As your app runs, SQL Database continuously learns your unique app patterns, adaptively tunes performance, and automatically improves reliability and data protection—freeing you to focus on your app. When demand for your app grows from a handful of devices and customers to millions, SQL Database is a database as a service that can scale along with you, on the fly, with virtually no app downtime. If you’re a SaaS app developer writing a multitenant app servicing many customers, you often make trade-offs in customer performance, management, and security. With SQL Database as your SaaS platform, you no longer have to make that compromise. SQL Database helps you manage and monitor multitenant apps and gain isolation benefits of one-customer-per-database. SQL Database allows you to focus on what you do best: building great apps. Develop your app and connect to SQL Database with the tools and platforms you prefer, and deliver with the speed and efficiency your business demands. SQL Database helps you build security-enhanced apps in the cloud by providing built-in protection and security features. With physical and operational security, Azure SQL Database helps you meet the most stringent regulatory compliances. What is the current version of SQL Database? What is the SLA for SQL Database? We guarantee at least 99.99% of the time customers will have connectivity between their single or elastic Basic, Standard, or Premium Microsoft Azure SQL Database and our Internet gateway. For more information, see SLA. How do I reset the password for the server admin? In the Azure portal click SQL Servers, select the server from the list, and then click Reset Password. How do I manage databases and logins? See Managing databases and logins. How do I make sure only authorized IP addresses are allowed to access a server? See How to: Configure firewall settings on SQL Database. How does the usage of SQL Database show up on my bill? SQL Database bills on a predictable hourly rate based on both the service tier + performance level for single databases or eDTUs per elastic pool. Actual usage is computed and pro-rated hourly, so your bill might show fractions of an hour. For example, if a database exists for 12 hours in a month, your bill shows usage of 0.5 days. Additionally, service tiers + performance level and eDTUs per pool are broken out in the bill to make it easier to see the number of database days you used for each in a single month. What if a single database is active for less than an hour or uses a higher service tier for less than an hour? You are billed for each hour a database exists using the highest service tier + performance level that applied during that hour, regardless of usage or whether the database was active for less than an hour. For example, if you create a single database and delete it five minutes later your bill reflects a charge for one database hour. If you create a Basic database and then immediately upgrade it to Standard S1, you are charged at the Standard S1 rate for the first hour. If you upgrade a database from Basic to Premium at 10:00 p.m. and upgrade completes at 1:35 a.m. on the following day, you are charged at the Premium rate starting at 1:00 a.m. If you downgrade a database from Premium to Basic at 11:00 a.m. and it completes at 2:15 p.m., then the database is charged at the Premium rate until 3:00 p.m., after which it is charged at the Basic rates. How does elastic pool usage show up on my bill and what happens when I change eDTUs per pool? Elastic pool charges show up on your bill as Elastic DTUs (eDTUs) in the increments shown under eDTUs per pool on the pricing page. There is no per-database charge for elastic pools. You are billed for each hour a pool exists at the highest eDTU, regardless of usage or whether the pool was active for less than an hour. If you create a Standard elastic pool with 200 eDTUs at 11:18 a.m., adding five databases to the pool, you are charged for 200 eDTUs for the whole hour, beginning at 11 a.m. through the remainder of the day. On Day 2, at 5:05 a.m., Database 1 begins consuming 50 eDTUs and holds steady through the day. Databases 2-5 fluctuate between 0 and 80 eDTUs. During the day, you add five other databases that consume varying eDTUs throughout the day. Day 2 is a full day billed at 200 eDTU. On Day 3, at 5 a.m. you add another 15 databases. Database usage increases throughout the day to the point where you decide to increase eDTUs for the pool from 200 to 400 at 8:05 p.m. Charges at the 200 eDTU level were in effect until 8 pm and increases to 400 eDTUs for the remaining four hours. An elastic pool is billed upon its creation, even when there are no databases in the pool. An elastic pool is billed hourly. This is the same metering frequency as for performance levels of single databases. If an elastic pool is resized to a new number of eDTUs, then the pool is not billed according to the new amount of eDTUS until the resizing operation completes. This follows the same pattern as changing the performance level of single databases. The price of an elastic pool is based on the number of eDTUs of the pool. The price of an elastic pool is independent of the number and utilization of the elastic databases within it. Price is computed by (number of pool eDTUs)x(unit price per eDTU). The unit eDTU price for an elastic pool is higher than the unit DTU price for a single database in the same service tier. For details, see SQL Database pricing. To understand the eDTUs and service tiers, see SQL Database options and performance. How does the use of active geo-replication in an elastic pool show up on my bill? How does the use of the auditing feature impact my bill? Auditing is built into the SQL Database service at no extra cost and is available to Basic, Standard, Premium, and Premium RS databases. However, to store the audit logs, the auditing feature uses an Azure Storage account, and rates for tables and queues in Azure Storage apply based on the size of your audit log. How do I find the right service tier and performance level for single databases and elastic pools? There are a few tools available to you. For on-premises databases, use the DTU sizing advisor to recommend the databases and DTUs required, and evaluate multiple databases for elastic pools. To see whether you need to dial a single database up or down, see performance guidance for single databases. How often can I change the service tier or performance level of a single database? You can change the service tier (between Basic, Standard, Premium, and Premium RS) or the performance level within a service tier (for example, S1 to S2) as often as you want. For earlier version databases, you can change the service tier or performance level a total of four times in a 24-hour period. How often can I adjust the eDTUs per pool? How long does it take to change the service tier or performance level of a single database or move a database in and out of an elastic pool? Changing the service tier of a database and moving in and out of a pool requires the database to be copied on the platform as a background operation. Changing the service tier can take from a few minutes to several hours depending on the size of the databases. In both cases, the databases remain online and available during the move. For details on changing single databases, see Change the service tier of a database. When should I use a single database vs. elastic databases? In general, elastic pools are designed for a typical software-as-a-service (SaaS) application pattern, where there is one database per customer or tenant. Purchasing individual databases and overprovisioning to meet the variable and peak demand for each database is often not cost efficient. With pools, you manage the collective performance of the pool, and the databases scale up and down automatically. Azure’s intelligent engine recommends a pool for databases when a usage pattern warrants it. For details, see Elastic pool guidance. What does it mean to have up to 200% of your maximum provisioned database storage for backup storage? Backup storage is the storage associated with your automated database backups that are used for Point-In-Time-Restore and geo-restore. Microsoft Azure SQL Database provides up to 200% of your maximum provisioned database storage of backup storage at no additional cost. For example, if you have a Standard DB instance with a provisioned DB size of 250 GB, you are provided with 500 GB of backup storage at no additional charge. If your database exceeds the provided backup storage, you can choose to reduce the retention period by contacting Azure Support or pay for the extra backup storage billed at standard Read-Access Geographically Redundant Storage (RA-GRS) rate. For more information on RA-GRS billing, see Storage Pricing Details. I’m moving from Web/Business to the new service tiers, what do I need to know? Azure SQL Web and Business databases are now retired. The Basic, Standard, Premium, Premium RS, and Elastic tiers replace the retiring Web and Business databases. What is an expected replication lag when geo-replicating a database between two regions within the same Azure geography? We are currently supporting an RPO of five seconds and the replication lag has been less than that when the geo-secondary is hosted in the Azure recommended paired region and at the same service tier. What is an expected replication lag when geo-secondary is created in the same region as the primary database? Based on empirical data, there is not too much difference between intra-region and inter-region replication lag when the Azure recommended paired region is used. If there is a network failure between two regions, how does the retry logic work when geo-replication is set up? If there is a disconnect, we retry every 10 seconds to re-establish connections. What can I do to guarantee that a critical change on the primary database is replicated? The geo-secondary is an async replica and we do not try to keep it in full sync with the primary. But we provide a method to force synchronization to ensure the replication of critical changes (for example, password updates). Forced synchronization impacts performance because it blocks the calling thread until all committed transactions are replicated. For details, see sp_wait_for_database_copy_sync. What tools are available to monitor the replication lag between the primary database and geo-secondary? We expose the real-time replication lag between the primary database and geo-secondary through a DMV. For details, see sys.dm_geo_replication_link_status. In the Azure portal, click SQL databases, select a database from the list, and then click Copy. See Copy an Azure SQL database for more detail. In the Azure portal, click SQL servers and then select the server that hosts your database from the list. Click Move, and then pick the resources to move and the subscription to move to. SUPER Productivity – Business happens anywhere, at any time. 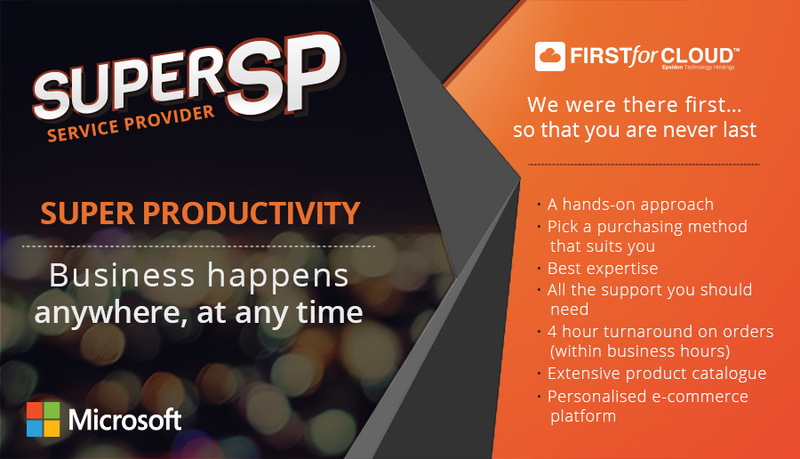 In the Super Productivity Series, we will be looking at the various tools and innovative advances Microsoft has included in some of its Cloud based solutions. The thinking behind this series is to sell convenience, a concept, a business problem solver as opposed to selling a specific product to your customer. Being an IT Reseller is not easy as you often have to find creative ways of making your customers see the value of a specific product or service. 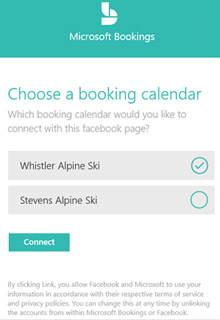 Microsoft Bookings is a new feature that allows your clients to make bookings for a service through an online calendar. Your client can even pick a specific day, service, and even a particular staff member they prefer. Bookings gives you a quick and easy alternative to scheduling appointments over the phone. With a customizable public webpage, your customers can easily find available times and available appointments any time of day. Once you have installed Bookings, you get a private calendar for managing your schedule, and automatic confirmations and reminders to save you time. Your customers will love the flexibility, convenience, and control they get with Bookings. Being able to make and manage any booking online simplifies scheduling and cuts down on phone tag. Some of your customers might prefer calling and emailing to set up appointments, worry not, you will be able to enter information manually and all confirmations and reminders will be sent to you as usual. As with all of the Office 365 apps, Bookings is a tile in the app launcher. Click the tile to launch the app.The first time you open the app, you’ll see the home page, which includes a left nav and three prominent tiles that guide you through setup and introduce new features. 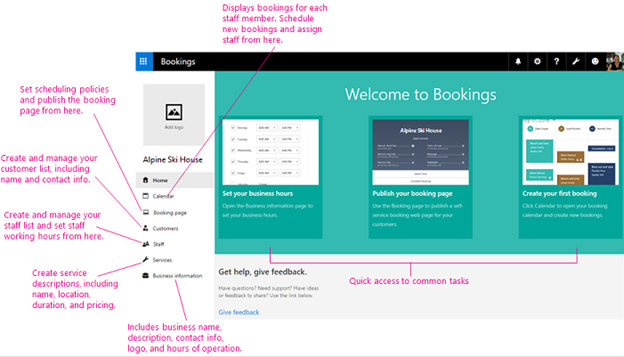 Use the following how-tos to get up and running with Bookings. 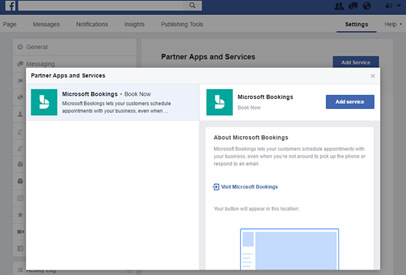 Microsoft Bookings integrates with Facebook to make it easy for your customers to schedule appointments from your business’ Facebook page. When booking an appointment, customers select the service and time that works for them. Their contact information is filled in for them automatically. First, you need to make sure you have already set up Microsoft Bookings in Office 365 and published your Booking Page. 1. 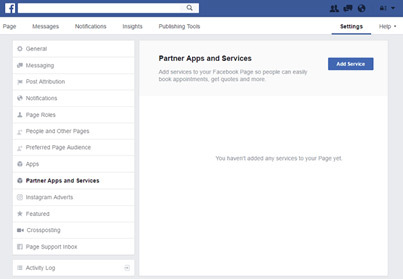 Open your business Facebook page. 6. A new tab will open. Sign into your Office 365 account when prompted. 7. 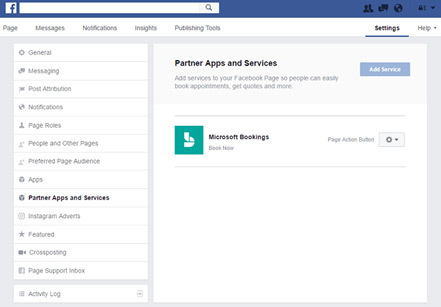 When you see your booking calendars, choose the one you want to connect to your Facebook page > Connect. 8. The tab will close and you’ll return to Facebook. Now you’re all set to receive Bookings through your Facebook page! When will Bookings be available? It is currently rolling out to Office 365 Business Premium subscribers who are in the First Release program and will roll out to all Business Premium subscribers worldwide in the coming months. Which Office 365 subscriptions have access to Bookings? Bookings will be available with an Office 365 Business Premium subscription. As a business owner, do all my staff need to be Office 365 subscribers? No. You only need one Office 365 Business Premium account to set up and manage Bookings. Your staff can use any email service. How do I manage the appointments while I am away from the office? In the next few weeks, Microsoft Bookings will deliver a companion app that will allow designated users with an Office 365 subscription to manage and see all appointments as well as all customers’ information. Will my customers see my personal or business calendar? No. Your customers will only see the Bookings calendar that you publish online. You specify the services, times and staff that are visible on that calendar. Do my customers need a Microsoft account or an Office 365 subscription to be able to book with me? No. Your Bookings page is publicly available. To book an appointment, your customers only need to provide their name and email so that Bookings can send the confirmation email and reminder. Do my customers need to download an app to book an appointment? A. No. Your customers access your web-based booking page from any browser in a mobile device, tablet or laptop. The upcoming Bookings mobile app is only for the business owner to manage their Bookings calendar. Social media is abuzz with the latest in Microsoft’s Twitter feed, confirming what we were suspecting, and delivering what we were hoping for. 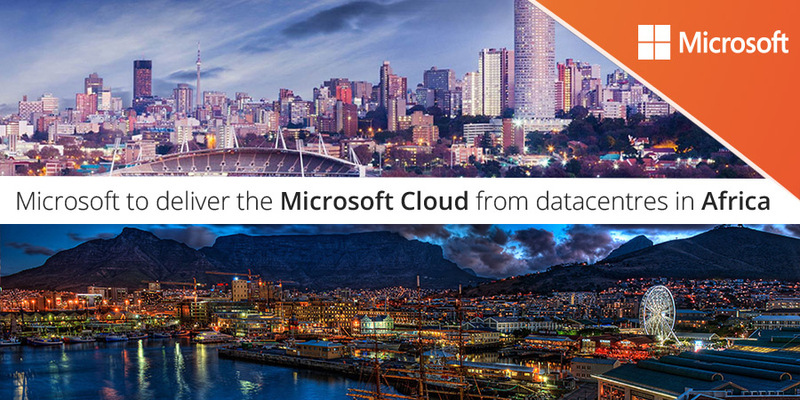 Microsoft will launch their own datacentres, based in Johannesburg and Cape Town. No date has been confirmed as yet, except that it will be in 2018. What does that mean for you? You can re-open all your cloud discussions with potential customers. Those who were concerned about latency, data sovereignty, POPPI, and the list goes on – all of those concerns will be addressed with this new development. Go knock on those doors again. Start the conversations. Get cooking. Remember to contact us if you need assistance with those conversations or market approaches. Additionally, we still offer the co-marketing opportunities to our CSP partners. This is a good time to get it going. The Cloud Solution Provider program combines Microsoft’s core Cloud products (Office 365, Dynamics 365, Enterprise Mobility and Security, and Azure) into one program. It also allows partners to transact and provide these solutions, along with other complementary cloud offerings, in a way that best suits you as the partner. Sign up your customers to your CSP offerings instantly*. Our program gives you as the partner access to support, and an extensive catalogue of services and solutions to compliment what your customers are using. Manage your expenses by leveraging off the platform offered by us as your preferred indirect CSP – without having to make any substantial capital investments to build out your unique infrastructure or services capacity. Your First for Cloud webstore is as unique as your business is. Sell the offerings that appeal to you and to your customer base while making healthy margins and satisfying customer needs. 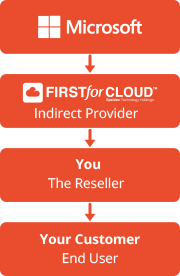 When you become an Indirect CSP reseller through First for Cloud, you partner with us as your Indirect Provider, so that you can have an end to end relationship with your customers. Through First for Cloud, you are able to sell Microsoft Cloud Solutions without having to make large upfront infrastructure, support, billing and invoicing. With all of this taken care of, you can focus on other aspects of your business and provide your customers with more value. As an Indirect reseller, you generate revenue by selling Microsoft Cloud Products, however, the only way to differentiate your business and maximize on each opportunity, you will need to attach your value – added services, like, tailor made deployment, fast and efficient migration, software customizations and custom Line – of – Business applications, support, maintenance and training by a Partner who knows their needs and their environment best. Not all revenue streams are equal. A Partner that focuses entirely on product revenue has the biggest barrier and will only see margins in the range of 5 – 20%. Margins for products are normally tied to vendor discounts and incentives. Without a change in strategy and desire to fund programs, you have the least control over your Business Growth and your Business’ destiny. Project Services range from about 35% – 45% gross margin but this has been affected by differentiation in the channel which has caused billable pricing points to hold steady for the last few years while the increasing costs of salaries and benefit costs of consultants as well as inflation has eroded profitability. In response to these factors, aggressive and entrepreneurial members of the channel have changed with the times and kept ahead of the curve, have gone after the higher margin opportunities of professional and managed services. This generates between 45% – 55% gross margin and including your unique IP and value propositions can exceed 65%. Set yourself up for maximum reward. Gravitate towards the recurring revenue lines and realize healthy growth presented with much higher valuations. This can drastically increase your company value. By being a cloud partner, you are almost guaranteed to become more profitable, grow faster, and have more recurring revenue. Best of Breed products, such as: AWS, Azure, O365, Kaspersky, IBM Softlayer to name a few. The products cover IaaS, PaaS and SaaS. You can – Compare different services before making a decision and you, the reseller, keeps your valuable relationship with your customer. 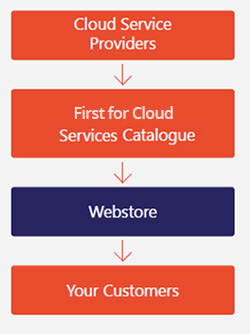 A First for Cloud webstore is an online partner branded shop which enables resellers to sell cloud services to your end-users. 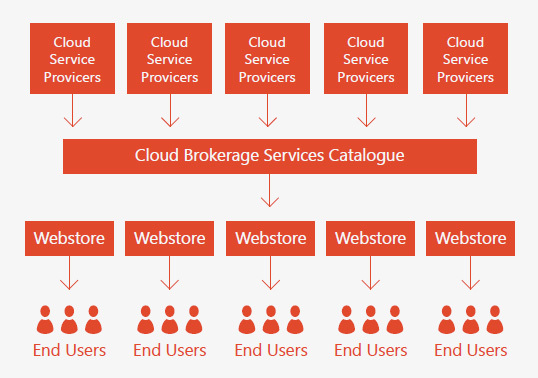 Cloud services from the top global cloud providers and vendors are supplied through the First for Cloud Catalogue, and resellers have the ability to select which services they want to resell via their own branded First for Cloud webstore. The Webstore is created with your own company branding and url. Store is up and running within 30 days from signing of Contract. You will always own your customers. 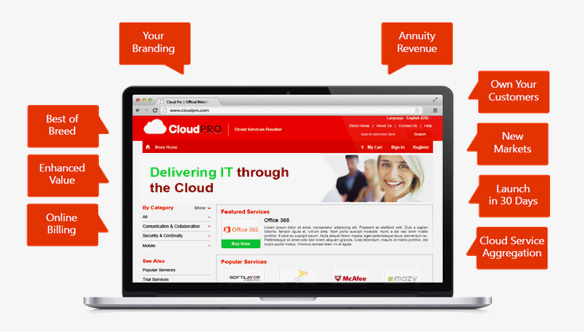 The webstore gives you the opportunity to create an Annuity Revenue stream. Gives you the means to target new markets and new revenue / business benefits. All billing is done online and through the Webstore platform. 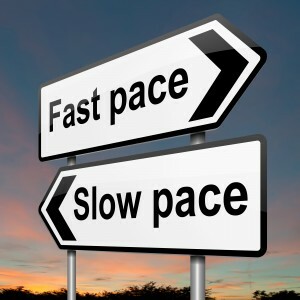 There are two speeds in the next evolution of IT – yesterday and tomorrow! Will traditional IT be your legacy, or will you step up a gear, and move ahead of the crowd? The traditional IT model of CAPEX and OPEX coming together to operate in a so-called heterogeneous environment where legacy systems and often outdated, and inflated human resources are combined to produce a computative output is fast becoming overly expensive and to a large degree redundant. Costs are high! Sunken costs, such as for data centres, cooling, power and lights are astronomical, and supply is often not as reliable as expected – especially in South Africa. And with the SPLA licensing model, customers are “locked-in” to a fixed term contract where changes are very difficult, and oftentimes impossible to implement. 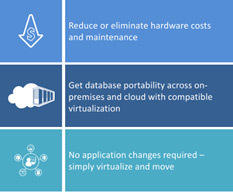 The Microsoft Azure Cloud, through the Cloud Solution Provider (CSP) Program, is the world’s most holistic and complete Hyperscale Cloud and allows for not only born-in-the-cloud usage, where services are consumed as and when needed, but also for hybrid cloud services (on-premise to Cloud interoperability). Licensing is consumed, not procured, and is generally a part of a larger deployment, reducing cost. Monthly bills are generated by monthly usage – if you don’t use anything, you don’t get billed! It’s as simple as that! No more “extra” licenses not being used, but being paid for. Not only that, but your existing SPLA licensing (T&C apply) can be utilized in Azure, allowing for a reduction in costs as (certain) licensing is being “pulled in” to the Azure environment… And you don’t have to shelve paid for licenses just to utilise the Cloud! 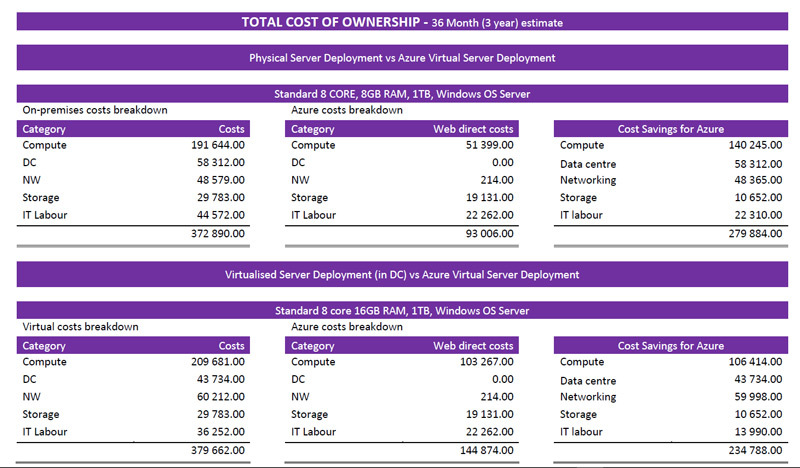 So, cost savings on data centre, IT administration staff, server, storage and networking components means that deploying ITaaS in the Azure Cloud is the way forward, the FAST PACE. * SPLA is for organizations that want to offer hosted software and services to customers, such as web hosting, hosted applications, messaging, collaboration, and platform infrastructure. ** CSP is for organizations that want the agility an flexibility of a true Cloud experience, where licenses are consumed and utilised as and when needed. Spin up, shut down, pay for what you use! *Pricing only applicable for South African market and subject to change. USD values available on request.